There are most probably only a hand full of scenic routes around the world that can hold a candle to the roads that circle the Cape Peninsula to form the Cape Peninsula Scenic Drive. From the winding M3 route through leafy southern suburbs, the vistas of Boyes drive above Muizenberg, the splendour of Chapman’s Peak between Noordhoek and Hout Bay to the last stretch along the Atlantic Seaboard past Llandudno through Campsbay, Seapoint and then full circle back to the City of Cape Town, this is a true “bucket list sightseeing experience”. There are many ways of experiencing the Cape Scenic Route. 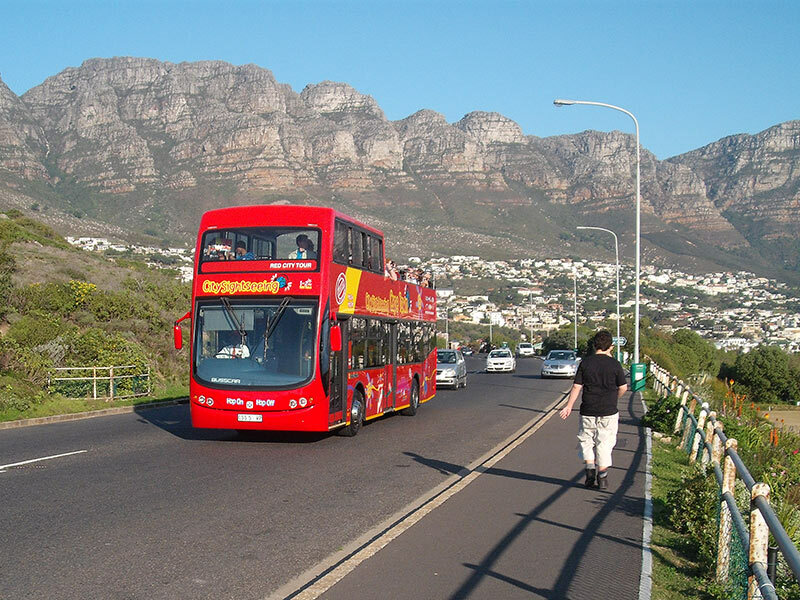 A popular way of seeing the more northerly section is taking the Cape Town City Sight Seeing Bus around to Kirstenbosch, Hout Bay and the Atlantic Seaboard. A prime attraction on the outskirts of Simon’s Town is of course the African Penguin colony of Boulders Beach. The beach forms part of the Table Mountain National Park Marine Protected Area and an entry fee is charged to the beach and penguin colony enclosure. Read more here about this great, “bucket list” experience! Beautiful scenic lookout stops can be made along this short elevated route above Muizenberg and Kalk Bay. It can get quite crowded at times, especially during the whale season when Southern Right Whales come toe False Bay to Calf and nurse their young between August and December. Whales can be seen breaching, when they launch straight up and almost completely out of the water and then come splashing back down with a thunderous crash – a special treat that never looses its thrill factor. This quaint little village boasts a great selection of antique Shops, book shops, art galleries and restaurants and is well worth a visit. Check out this great blog for the latest info on the shops, eateries and a whole lot more. Houtbay is a working fishing village, with the harbour and waterfront development boasting great restaurants, offering seafood and other specialties. It is a popular tourist destination with many B&B’s and holiday facilities. Boat rides to view the seal colonies on nearby Duiker Island are very popular. A great variety of arts and crafts abound and the Hout Bay Harbour Market with its great art, crafts and food stalls, has become a popular weekend attraction. Lying on the last stretch of the route back to Cape Town and just a few minutes from Bayview House, Campsbay Beach and the four distinct white sandy sections of Clifton are arguably the most renowned beaches in South Africa. The suburb of Campsbay offers great shopping and top restaurants, while the beachfront facilities are world class. Definitely the right spot for walking on the beach, a game of valley ball, or simply shaking out your towel on the white sandy surface and worshipping the sun! Bayview House is an excellent base from which to embark on your Cape Peninsula Scenic Drive adventure. The location is just beneath Lions head and practically in the shadow of Table Mountain. It overlooks Cape Town City Bowl, the V&A Waterfront and Table Bay with the rest of the Cape Peninsula just waiting to be explored.